Everybody talks about the work they do. It’s a staple topic of conversation over meals, at meetings, during sporting events, in hallways, on airplanes, between classes, and yes, sometimes in elevators. Most librarians realize that they should have an “elevator speech” about their work, but few actually do. Sure, you can just stumble through an answer, but then you miss out on a teachable moment. It’s important to remember that a majority of people don’t really know what librarians do. Too many folks think we just read all day, check out books, and fix printer jams. This lack of understanding is part of the reason that we have to fight for funding and to constantly assure stakeholders that the internet did not (and cannot) replace library collections and their highly skilled caretakers. If you work in a library, you’re probably not in a high-rise building with lots of non-librarians. Besides, nowadays, elevator riders usually stare at their shoes, their phones, or, if they’re lucky, a news screen. Few people want to start conversations between floors anymore. But you can easily find other opportunities to deliver something akin to an elevator speech. In direct conflict with what your parents taught you, I encourage you to talk to strangers—about the goodness of libraries, at least. As a library marketer and advocate, I do this all of the time. I could be waiting in a line or talking to sports teammates between games. 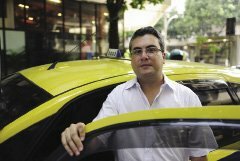 One of my favorite targets, though, is cabdrivers: They’re often talkative, and taxi rides offer great opportunities for one-on-one conversations that are brief but not so short that you can’t get a point across. This is how I do it. To anyone who works in LibraryLand, these responses can be annoying, hurtful, or downright aggravating. To me, as a library marketing expert, they’re terrifying. These responses scare me so much because they prove just how little the general public knows about libraries and how seldom they use or think about them. The fact that so many people from all walks of life think that libraries are dying could become a self-fulfilling prophecy. Because when someone asks them about making a donation, attending a library event, signing up for a card, or voting for a budget increase, they’ll think it’s totally unnecessary. Inevitably, these “cabbie chats” turn into longer conversations. Once I’ve piqued the drivers’ interest, they ask further questions. Then they’re more likely to hear and remember what I say. So you can see how easy it is to educate your average Joe. (I can only recall having two female cabdrivers, ever.) One reason I recommend talking with these drivers is that you have much more time than you would during an elevator ride. So while you still need a good initial response to the stereotypical question “Aren’t libraries going away?” you can really have a meaningful 5- or 10-minute conversation after that. While this is a pretty simple thing for anyone to do, it works better with a little preparation. Here’s how to do it really well. 1. Choose your pithy responses ahead of time. These can come from many places. If you don’t already have your own favorites, write down ideas that you like. You can get useful facts and quotes from ALA at ala.org/offices/ola/quotablefacts/quotablefacts. I also have a whole chapter on this in my book, The Accidental Library Marketer (tinyurl.com/not4bzf). 2. Make sure your chosen comebacks are free of library lingo. Saying “Our circulation is through the roof, and people use our programming more than ever” is not clear to outsiders. (Circulation? Isn’t that what my blood does? Programming? Isn’t that what makes my computer run?) Speaking the way your listener does is key to ensuring that he understands you, plus it improves his chances of recalling and repeating what you said. 3. Once you have one or two attention-getting or shock-inducing phrases, practice them aloud. Seriously. This will make a huge difference in your delivery. Practice in front of the mirror or with family or friends. (Better yet, make this a librarywide exercise or a staff meeting topic.) You need to memorize your phrase and make sure you can say it without stumbling over words in order to have maximum impact. Also, visualize yourself doing this to build confidence. Then, if your listener is curious (or suitably impressed), he’ll ask just how that happens. That’s your chance to share more details. And by the way, you don’t need to wait for the driver to ask you a question. Feel free to start the conversation. Comment on the city, ask the driver how long he’s been a cabbie, mention that you’re excited to be in town for the library conference, or ask where the local library is, since you’re eager to visit while on your vacation. While I’m telling you how to do this well, I should also mention a few things that you definitely should not do. 2. Don’t argue. Simply inform. If the person doesn’t believe what you’re saying about how much libraries are used, have an emergency comeback at the ready. One of my personal favorites is “If libraries no longer mattered, then I doubt that Bill Gates, one of the smartest men in the country, would still be supporting them with millions of dollars.” Or flip the conversation with something like “Well, that may be true in your experience. But in my community ...” Agree to disagree if you must. You can’t win ’em all. 3. Never, ever go into a diatribe about how busy your library is, or start listing all of the individual tasks you do: “People use my library all the time! In a typical day, I answer 30 reference questions, fix the computers 10 times, do a storytime for a bunch of loud kids, and teach two classes.” This is the quickest way to lose someone. It’s difficult to accept, but really, nobody wants to hear how hard you work or how many times you had to clean up messes in the restrooms. Leave people with positive feelings. Of course, these tactics are good for more than just cabdrivers. No matter where I am, people’s reactions to my saying I work for libraries are almost always the same: They wonder whether libraries will be around much longer. It’s essential to be able to counter these doubts with facts. It’s vital to be able to answer questions about why libraries matter in the internet age. If librarians, trustees, Friends, and advocates can’t communicate the value in casual, individual conversations, then who can? Kathy Dempsey has edited MLS for 20 years, and she founded the library marketing consultancy Libraries Are Essential. She attends and speaks at many conferences, teaching library workers how to do better marketing and promotion. Her email addresses are kdempsey@infotoday.com (for MLS) and Kathy@LibrariesAreEssential.com.